My favorite fall ingredients are cranberries and pumpkin pie spices, and this recipe has both of them. Fall flavors come together to make this healthful, sugar free, dairy free, delicious and easy family favorite! This recipe is great because you can adapt it to suit your needs. 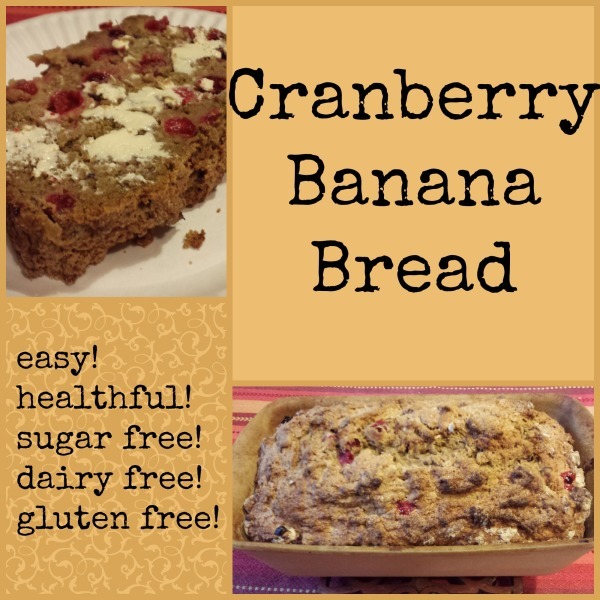 Use butter instead of coconut oil, add some walnuts, throw in some orange zest and use orange juice, take out the cranberries, sprinkle the top with a strudel topping… the possibilities are endless. This is a simple recipe I use and adapt for the different times of the year. October and November are cranberry and pumpkin months in our house, so this is a simple cranberry version we like to eat. Preheat the oven to 350 degrees F. Spray a 9×5” loaf pan. In a blender, add the chia seeds, dates, and almond milk. Let sit five minutes to allow the chia seeds to puff up and the dates to absorb some of the liquid. Add in the bananas, eggs, coconut oil, and vanilla. Blend well. In a separate bowl, mix the flour, cinnamon, cloves, allspice, nutmeg, baking powder, baking soda, and salt. In a bowl, mix the cranberries with the 1/4 cup flour. Fold into the batter. Pour into prepared loaf pan and bake about 60 minutes, until a toothpick inserted in the center comes out clean. 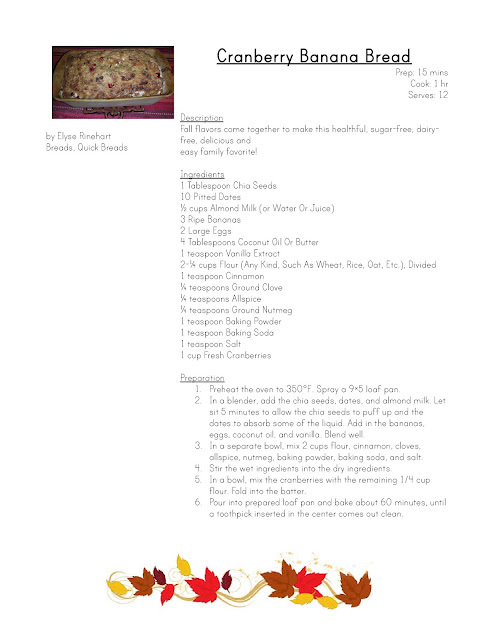 Easily print the recipe: Click here or the picture to print!